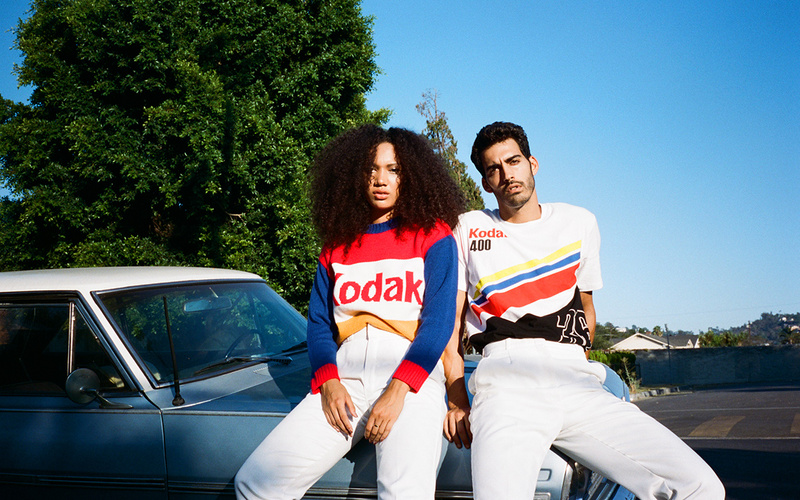 Kodak and fashion retailer Forever 21 have teamed up on a new apparel collection for the Fall 2018 season featuring some of Kodak’s many logos and designs from the Kodak brand’s storied history. The bright and vibrant apparel uses many of the original colors from Kodak branding and packaging from the 90’s and draws inspiration from Kodak’s days as a standout NASCAR team sponsor. The collection offers women’s t-shirts, crop tops, jackets and lounge wear; the men’s line includes tees, polos, pullovers and jerseys. Altogether twenty-six different items will be available in 600+ stores globally and are available in men’s, women’s and junior sizes. Kodak has been working on collaborations to drive brand awareness and advocacy with new audiences. The collection was produced with Hybrid Apparel, a Kodak Licensee who works closely with Kodak on brand licensing efforts in the apparel space. Additionally, by teaming up with Forever 21 and Hybrid, Kodak is expanding its reach and aligning itself towards future possibilities. “We are excited to further increase our brand visibility with industry leading partners like Forever 21 that will uniquely leverage our imaging history to further build opportunities and growth into the future with the Kodak brand,” said Joel Satin, Vice President, Global Brand Licensing. Forever 21 is enthusiastic about the collection and its call-back to the days when the Kodak logo was seen virtually everywhere. The line will be available in US stores today. Learn more. Kodak is a technology company focused on imaging. We provide – directly and through partnerships with other innovative companies – hardware, software, consumables and services to customers in graphic arts, commercial print, publishing, packaging, entertainment and commercial films, and consumer products markets. With our world-class R&D capabilities, innovative solutions portfolio and highly trusted brand, Kodak is helping customers around the globe to sustainably grow their own businesses and enjoy their lives. For additional information on Kodak, visit us at kodak.com, follow us on Twitter @Kodak, or like us on Facebook at Kodak. Founded in 1997, Hybrid Apparel is a full-service design, development, sourcing, production and apparel distribution company based in Cypress, California. Hybrid has a world-class sourcing and global supply chain infrastructure, with expertise in customer delivery and service across a wide-range of apparel categories and geographies. As the industry leader in brand and licensing management, Hybrid supports the best global and national brands as well as entertainment and licensed properties. For more information, visit hybridapparel.com.